Our sense of smell is perhaps one of the least understood out of all the five senses. In a lot ways, it is the one that is the least precise of them all. When you see an object, it is directly in your line of vision. Similarly, when you hear a sound you can probably tell the direction of the source of the sound. Now when it comes to the sense of smell and a scent passes your nose - well you're smelling that scent and all the scents of everything else in your surroundings at the same time. To locate a particular smell, you will have to go searching for exactly what you smell and its exact source. Apart from that, our sense of smell is also one of the most powerful senses. It is so because scent is tied to the formation of memories and can impact moods, because both processes are done in the same area of the brain. This explains why we hear of people who associate certain smells with particular memories. For example, someone might say that the smell of a perfume reminds them of the woman that visited their home to give them piano lessons during childhood. Seeing a piano may not evoke that memory. Instead, it is the aroma of the perfume that prompts the individual to remember that particular experience. Having established those facts, the multiplicity of aromas from things in our immediate surroundings can represent a wide variety of scents. When our nose picks up a scent, essentially it is recognizing the presence of a volatile molecule that has been separated from the source of the smell and is floating freely in the atmosphere. This can be anywhere between tens of thousands and hundreds of thousands of various kinds of “aromatics." Just a minor variation in the molecular formation of that particular aromatic can make a big difference in what the scent smells like. For example, there are only simple molecule changes that change pentyl butyrate to pentyl butanoate. In this process, a smell that smells more like a pear can be changed to a scent that smells more like apricot. These changes in the molecular formation of aromatics are what makes the wide variety of scents, such as bakery candle scents, that we know today. Scientists studying and researching in the field of scent have been able to create models that calculate how much a particular scent will be liked according to the molecular structure of that particular scent. Over the years the fragrance industry has been on the lower end of the scale when it comes to using technology in their approach. Most people are aware of the color wheel. There is a fragrance wheel that is comparable to the color wheel, in the sense that a specific group of scents are believed to belong together. 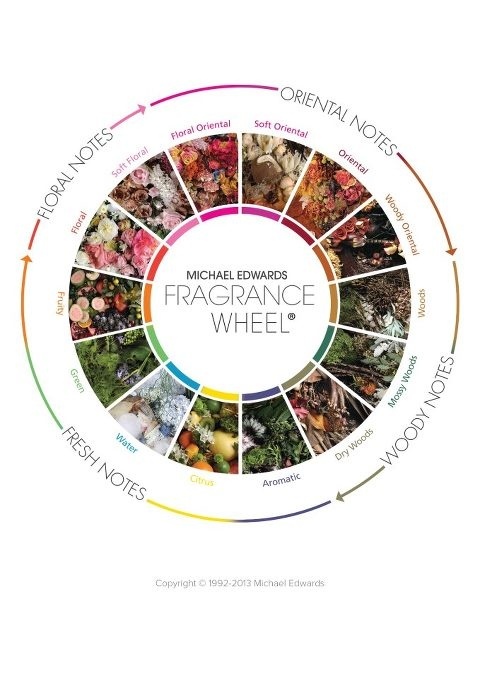 Below, is a fragrance wheel, created in 1983 by Michael Edwards, that explains how these fragrances come together. Of course the exact divisions of the fragrance wheel vary depending on who you talk to about it, but the original divisions that were put forward are as follows: woody (dry woods, woody oriental, mossy woods and aromatic), Oriental, (including soft aromatic spice fragrances), floral (soft floral, floral and Asian florals) and fresh (green, water/marine, citrus and fruity). In the center of the fragrance wheel there is the fougere, fern like aromatics, which is comprised of mixtures of different categories within the wheel. It's the fragrance wheel that enables comprehensive explanation of how fragrance is used to create those scents that enthusiasts buy, like your berry or citrus summer fragrances, spring floral blends, woodsy musk fragrances, and so many other much more complex scents. Because of their relatively low boiling point, head notes or top notes are the first to reach the air. Therefore, if you open a bottle and get a whiff of its fragrance, you will mostly be smelling the top notes. They usually stick around for just a few minutes, and are often used to cover the alcohol scent that the compounds are dissolved in and to bribe someone into giving the scent a try. Fruity, green, citrus and herb scents are often top notes. After the top notes disappear, next are the middle notes, which tend to last a bit longer than top notes, spanning from a few minutes to a few hours after bursting into the air. Here is where you will typically find spicy noted and floral scents. The last of the group are the base notes. You will be smelling them the whole time, though you may not be able to identify them until the top notes have expired. Sweet notes, woody notes musk and mossy notes are usually base notes. In the case of candles, the top notes may be just as essential to the scent ads the middle or base notes. When it comes to choosing the best candle fragrances, I realize that the how the various parts of fragrance operate together to create a complete scent is not fully considered when purchasing a scented candle. This is just my personal thought, however. Though the top note is what you will smell first, it is almost as if most candle makers want their candle to be described from top to middle to base in a bid to assist the customer in understanding how their candle will smell. However, this can prove to be problematic if the candle maker and/or the potential buyer does not understand how the notes in scents work together to create a final smell. The way that the candle maker explains the scent, perhaps, is misleading to the customer, who will expect to smell all the scents at once instead of recognizing them as the top one fades to leave the base and middle. As a result, many candle buyers are disappointed with their candles and their scent experience, just because they don’t know how fragrance works and unsure of exactly what to anticipate from their experience with scented candles.